Kimi, fantastic second in qualifying and quite a turnaround, it has to be said, from 12 months ago for you and Ferrari, very close to Mercedes, as Lewis said. You’ve got to be pleased with your own performance and that of your team? Kimi RÄIKKÖNEN: Yeah, I think if we look now we probably surprised ourselves a little bit. We expected a strong weekend but we knew that this place is not our strongest probably, so in the end the car turned out to be pretty good in qualifying conditions; we had many good laps. It’s been a while, so it’s nice to be here, especially [at] the home race for us. It’s probably our best qualifying this year as a team. We try to give [it] another good go tomorrow and give a good result, not just for ourselves but for our fans and all the Ferrari people behind us. And you and Kimi both got through Q1 without using a set of soft tyres as well didn’t you. Kimi, just touching on what Lewis just said there. It is a long run down to turn one, this is the second grand prix with the new rules on starts, so presumably any loss off the line is going to be really amplified by the time you get to turn one, so you’re obviously eyeing that as a key opportunity to challenge for the lead straight away. KR: Obviously, but I think in every circuit is more or less different length of straights to the first corner but any small issue you are always going to lose place, even if it’s long or short run. But I think it helps here. Hopefully we make let’s say a normal start and at least stay where we are but it’s going to help us at least during the first corners; it can easily be a mess when you are in the mid-pack and you almost have to stop sometimes. Hopefully we make a normal start and go from there and you know see what we can do. I expect it to not be an easy race but usually we’re more confident for the race than for qualifying, so hopefully it’s the same thing for tomorrow, so see what happens, to do our best and hopefully get a good result. 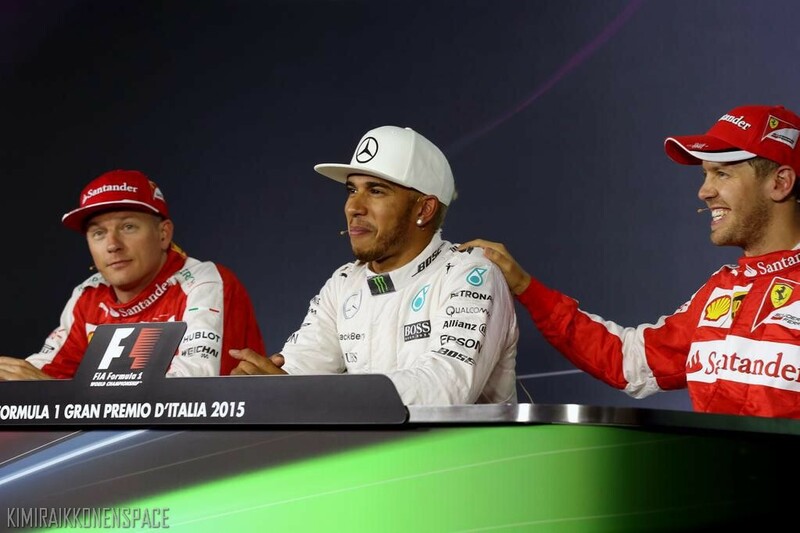 Q: (Heikki Kulta – Turun Sanomat) Kimi, as a Ferrari driver in Monza you are the first time in the front row. How much that means personally to you? KR: I think it’s a while that I’ve been in the front row – eight, ten years probably! But I think, what does it mean, I’m very happy for it obviously, and I’m happy for all the people who are supporting us and our team but, you know, the biggest thing is that much less troubles in the first corner if you make, let’s say, a normal start. It gives us a good chance for the race and obvious we have to do a good job in the race but it gives us a better chance for having a good result. It’s nice to get it right once in a while. It’s been a while so, especially here in the home grand prix of Ferrari, so let’s hope it brings us also a good result tomorrow. Q: (Peter Farkas – Auto Motor) Again, Seb and Kimi. Did you expect to be so close to the quickest Mercedes today – especially after yesterday when the different was quite big? And could you please explain what you did since yesterday to turn the situation around? How confident were you that it would be possible? KR: Like I said earlier, in a way is a bit surprised that we were this strong comparing to the Mercedes but, y’know, we made some small improvements and obviously people always talk so much about Fridays. It’s a Friday: you do whatever you want. It’s not about the laptimes. And worse, you don’t know what the others are doing. So, it’s pointless to say, ‘oh, we were bad yesterday’. We just did our stuff what we normally do. In the end, if you end up first or tenth, makes no difference if you know what you’ve been doing. So, we’ve been just… improve a bit the car and drove a bit better than yesterday. Yesterday I didn’t feel I was driving very well and then it turned out to be in qualifying it all worked out well for us. Obviously we’re still not happy, we’re second and third but I think it’s a place where we expected it to be a bit more difficult because the circuit layout. So it was a bit surprise but a nice one and I think things have been working well. Q: (Livio Oricchio – GloboEsporte) To both Ferrari drivers, considering the analysis of the long runs you did yesterday with both kinds of tyres and also this morning, and comparing with what we saw from Mercedes, what is a realistic prediction for the race? KR: Like I’ve said already, we will try to do our best and see where we end up. Obviously we want to at least keep the places that we have right now but the main aim is to try to win races and that’s why we are here. But it’s pointless to start guessing where we’re going to end up. Q: (Nicolangelo Cioppi – Il Cittadino Canadase) Sebastian and Kimi, do you think it’s possible from third place and second place for Kimi to win the race tomorrow here in Monza like in 2008. I was here in 2008 and I enjoyed it with you, even if it was raining like crazy. SV: Well, I think there’s always a chance. Obviously in 2008 I was on pole, didn’t manage that today but I think since it’s dry tomorrow, I think we have much better chances this year than I would have had in dry conditions in 2008. So the bottom line is I think it’s always possible, it’s always possible to have a surprise. I think we had some surprises this year so we like surprises and if we can surprise tomorrow then it would be a nice surprise. KR: Who knows? Like I said, we try our best and hopefully achieve a great result and try to win if possible. It would be great to have a good result for the team. Q: (Heikki Kulta – Turun Sanomat) Kimi, you managed to beat Sebastian by five hundredths of a second. Where did you take that? KR: I don’t know. I haven’t seen the data so somewhere, doesn’t matter where it was. I gained on my previous best in the last corner. It doesn’t matter to me where it happens. He did nothing wrong. Not his fault if there’s a glitch. Just want to thank you for all your hard work on KRS – it’s very much appreciated.